Pulau Tenggol is located between Redang Island and Tioman Island, 12 nautical miles off the east coast of peninsular Malaysia. It can be reached from the coastal town of Kuala Dungan with a 45 minute boat ride. The island is just 3km long and 2km wide. Tenggol diving is renowned for it’s wall diving off the eastern side. Some of the walls drop as deep as 48m. Pristine coral and the chance to see large pelagics makes for exciting diving. Currents can be strong here. White tip reef sharks and blacktip reef sharks can be seen in deeper areas as can large stingrays. Reef fish includes bumphead parrotfish, titan triggerfish, oriental sweetlips, batfish and much much more. Pelagics like barracuda and tuna like the strong currents. From August to October whale sharks pass by on their migratory route. Popular dive sites include “Amazing Grace,” “The Fishbowl” and “The Highway” although there are over 10 dive sites around Tenggol and the small surrounding islets. Pulau Kapas has pristine white sandy beaches and some shallow sloping reefs that are more popular with snorkellers than divers. Visibility is not that good and most of the fish life on the reef is pretty small. However whale sharks do visit this area in season. There is also a small wreck of a Japanese landing craft here. It sits upright on the seabed and still has her anti aircraft guns on the fore deck. Soft coral and encrusting sponge covers the wreck. 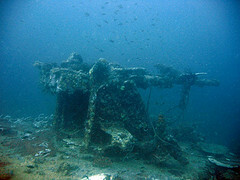 The Kuantan Wreck is located about 12 nautical miles from Kuantan and is laying in 23m of water on her port side. It’s an easy dive with the shallowest part of the wreck at 14m. The wreck is 80m long and 10m wide and is covered in coral and encrusting sponge. Moray eels, scorpionfish and lionfish can be found on the wreck as can schools of snapper and batfish. Leopard sharks are often seen here plus large stingrays and turtles. Barracuda can be spotted in the blue. There are also two very large groupers resident here. The large propeller is still intact at the stern.